When a cop found himself in grave danger, this teen sprung into action, putting his life on the line for an officer he had never met. Joe Chambers, 17, a volunteer firefighter from Ridley Park, Pennsylvania, was at his sister's house on Saturday when he heard a loud crash outside, Philly.com reported. The teen ran outside to find that a pickup truck had collided with a patrol car, and Officer Mark Kimsey, 30, was trapped inside. Chambers knew it was time to step up. Chambers visiting Officer Kimsey in the hospital. "I started running full speed down the street and as I got to the car, the bottom of the car caught fire and then the hood caught fire . . . the door was jammed shut, I couldn't get it open," the 17-year-old told Philly.com. The high school senior yelled out for help, and Dante Johnson, 24, came to his aid, according to WPVI. The two pulled Kimsey from his vehicle to safety. Chambers and Johnson also made sure the truck driver was safe. Kimsey with his "hero," Chambers. Kimsey had been responding to an emergency when the pickup truck driver broadsided his squad car, denting the door and trapping him inside, according to WPVI. The officer had lost feeling in his legs and was slipping in and out of consciousness by the time Chambers got to his vehicle. With the door crushed from the harsh impact of the truck, Kimsey needed to be pulled out of his window. Just minutes after Kimsey was rescued, the entire car was engulfed in flames. The officer was later hospitalized in stable condition, and was released on Monday, according to NBC Philadelphia. 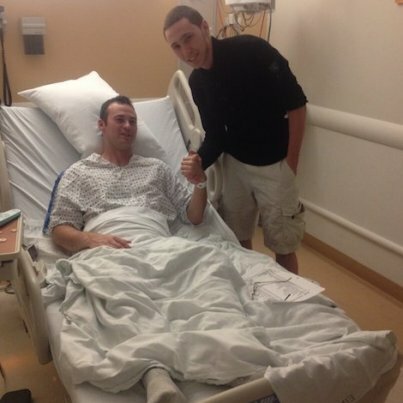 The teen visited Chambers in the hospital and the officer exchanged words of gratitude with his rescuer. 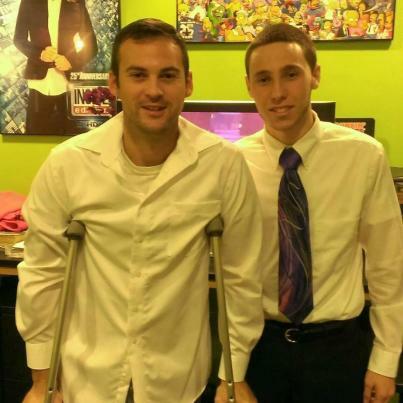 While the teen felt that his actions were nothing extraordinary, he is being recognized as a true hero. "He's my hero, by far," Kimsey told NBC Philadelphia. "If he wouldn't have pulled me out of that car, I'd still be sitting in it."